Participation in several traditional forms of religious observance has declined in recent years. For example, the share of Americans who say they attend religious services at least once a week has ticked down by 3 percentage points since 2007, as has the share who say they pray every day. These declines are closely connected to the continued growth of the religiously unaffiliated population. Religious “nones” are far less religiously observant than people who identify with a religion. But among those who are affiliated with a religion, levels of worship attendance and personal prayer have both been very steady since 2007. While religious service attendance and frequency of prayer have declined among the general public, some indicators of religious engagement have ticked upward, such as the percentage of religiously affiliated adults who share their faith regularly. Growing numbers of Americans also say they regularly feel a deep sense of spiritual peace and well-being or say they feel a deep sense of wonder about the universe. This chapter explores the ways in which American adults engage in religious practices and experiences, highlighting both how religious participation is changing and how it varies across religious groups. As they do on many traditional measures of religious observance, Jehovah’s Witnesses and Mormons report the highest levels of regular worship attendance; 85% of Jehovah’s Witnesses say they attend religious services at least once a week, as do 77% of Mormons. Most evangelical Protestants (58%) and roughly half of members of the historically black Protestant tradition (53%) also say they attend religious services at least once a week, though the share of people in the historically black Protestant tradition reporting weekly worship attendance has declined 6 percentage points since 2007. Among other Christian groups, smaller shares (including 39% of Catholics and 33% of mainline Protestants) say they attend church weekly. Regular attendance among members of non-Christian faiths has remained relatively stable since 2007. More women than men say they attend religious services at least once a week (40% vs. 31%). This gender gap is evident among a variety of Christian groups, though not among Mormons. And among Christians overall, more blacks than Hispanics and whites say they attend religious services weekly or more. Older Americans are more likely than younger Americans to say they attend services at least once a week. Among Christian groups, the age gap is particularly large for Catholics; most Catholics ages 65 and older (56%) say they go to church every week, compared with half as many Catholic adults under age 30 (28%). There also are large differences by age among members of the historically black Protestant tradition and mainline Protestants. Age differences in worship attendance are smaller or nonexistent among evangelical Protestants, Mormons and Jews. Among the adult population overall, there is virtually no difference in frequency of religious service attendance between college graduates and those with less education. Among many Christian groups, however, college graduates are at least somewhat more likely than those with less education to say they attend religious services regularly. Half of U.S. adults say they belong to a local house of worship. Among Christian groups, about seven-in-ten people who identify with the historically black Protestant tradition (72%) and the evangelical Protestant tradition (69%) say they belong to a local congregation. Roughly six-in-ten Catholics (59%) and 57% of mainline Protestants say they are official members of a church. This question was not asked as part of the 2007 Religious Landscape Study. Adherents of non-Christian religions tend to be less likely than Christians to report official membership in a house of worship. Only one-in-five Buddhists and Hindus are members of a house of worship, along with roughly a third of Muslims (34%). This survey finds that about half of U.S. Jews (53%) say they belong to a synagogue, though other surveys have found lower membership rates, perhaps in part due to different question wording. Just 8% of U.S. adults who describe themselves, religiously, as atheist, agnostic or “nothing in particular” belong to a local house of worship. A quarter of American adults (24%) say they participate in prayer groups, scripture study groups or other types of religious education at least once a week. 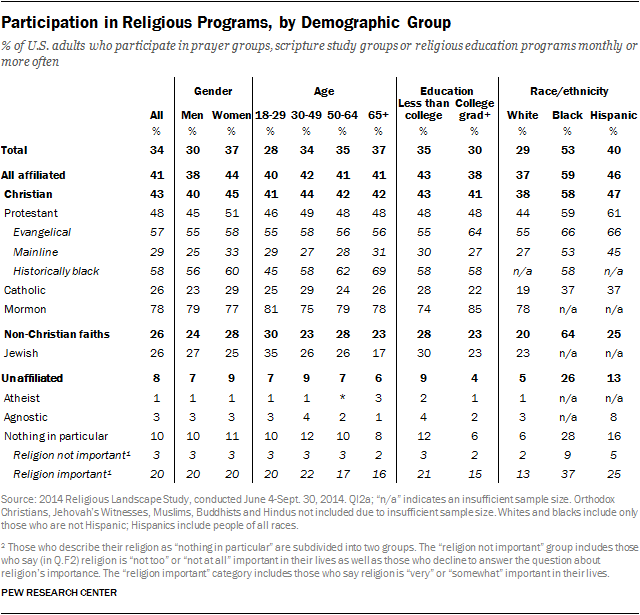 Although the share of Americans who identify with a religion has been shrinking, the percentage of religiously affiliated adults who report participation in prayer groups, scripture study groups or religious education programs is somewhat higher today than it was in 2007 (30% vs. 27%). Again, Jehovah’s Witnesses and Mormons are notable for their high levels of weekly involvement in these types of groups (85% and 71%, respectively). More than four-in-ten members of evangelical and historically black Protestant churches also participate in such programs at least once a week (44% each). Some of the demographic groups that are especially religiously observant in other ways – including blacks, older adults, women and adults without a college degree – also are more likely than others to say they participate in prayer groups, scripture study groups or religious education programs at least monthly. In several cases, however, these demographic differences are smaller within religious traditions than among the public as a whole. While a majority of Americans continue to say they pray at least once a day (55%), the share of U.S. adults who seldom or never pray has increased from 18% to 23% since 2007. This change is mainly tied to the growing share of Americans who say they have no religious affiliation. Religiously unaffiliated adults pray far less frequently compared with those who identify with a religion, and an increasing share of religious “nones” say they seldom or never pray. Among those who do identify with a religious group, there have been only modest changes in self-reported frequency of prayer. Jehovah’s Witnesses remain among the most prayerful religious groups, with fully 90% saying they pray daily. Large majorities of Mormons (85%), members of the historically black Protestant tradition (80%) and evangelical Protestants (79%) also say they pray every day. Smaller majorities of Catholics (59%), Orthodox Christians (57%) and mainline Protestants (54%) report praying daily. 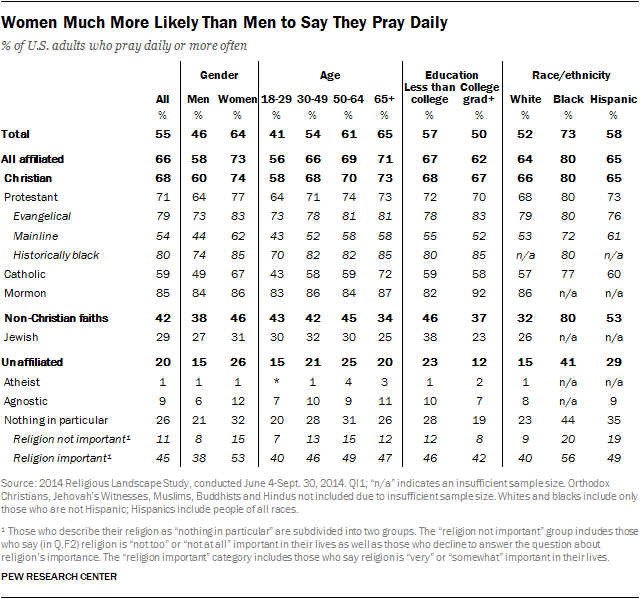 As with other measures of religious involvement, women are considerably more likely than men to say they pray daily, a pattern seen among many religious traditions. Similarly, older adults engage in daily prayer at much higher rates than younger adults, both among Americans overall and across several religious groups. And across the religiously affiliated and unaffiliated, blacks are much more likely than Hispanics and whites to say they pray on a daily basis. College graduates are less likely than others to say they pray daily, at least in part because college graduates are far more likely than those with less education to identify as atheists or agnostics (and very few atheists and agnostics pray regularly). Among Christians, there is little difference in frequency of prayer between college graduates and those with less education. And among Mormons and evangelical Protestants in particular, college graduates are noticeably more likely than others to say they pray daily. As was the case in 2007, the 2014 Religious Landscape Study finds that 35% of U.S. adults say they read scripture at least once a week. Regular scripture reading is most common among Jehovah’s Witnesses (88% of whom say they read scripture at least once a week), Mormons (77%), evangelical Protestants (63%) and members of the historically black Protestant tradition (61%). Older adults are much more likely than younger adults to say they read scripture weekly or more, and blacks are more likely than Hispanics or whites to say they participate in this activity. 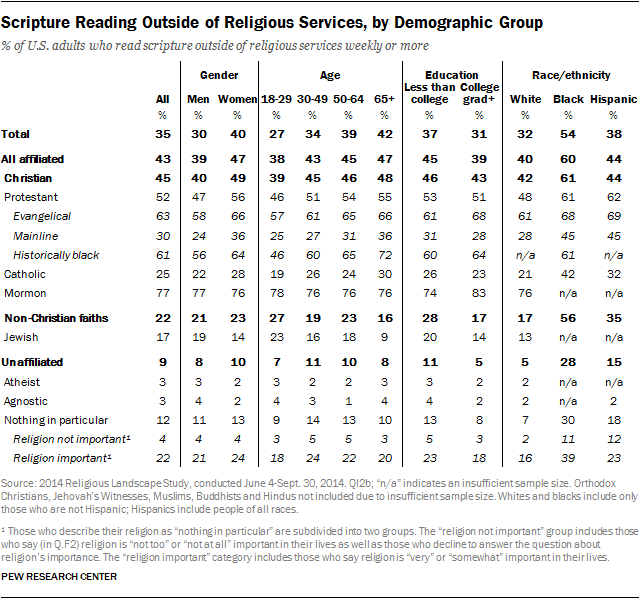 Additionally, more women than men say they read scripture at least weekly. Those with less education are more likely than college graduates to say they read scripture outside of religious services at least weekly, but among some religious groups, such as evangelical Protestants and Mormons, college graduates are more likely to read scripture on a weekly basis. However, sizable minorities of religiously unaffiliated adults, including one-in-five atheists (19%), a quarter of agnostics (24%) and 28% of those who describe their religion as “nothing in particular,” also say they meditate at least once a week. Respondents who say they meditate regularly may or may not do so in a religious sense; many people meditate for reasons other than religion or spirituality. About a quarter of adults in the U.S. who are affiliated with a particular religion (26%) say they share their faith with others at least once a week, up 3 percentage points since 2007. 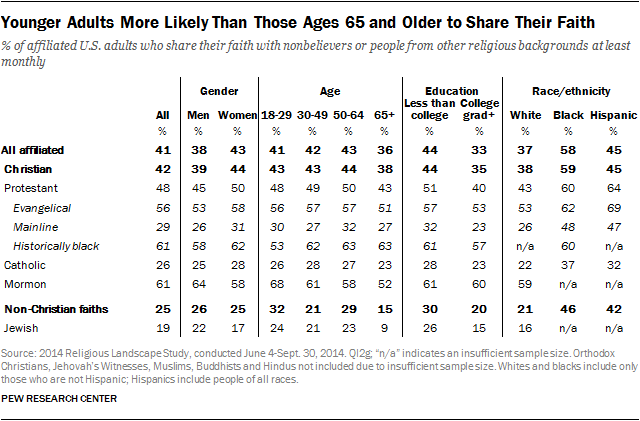 Christians are much more likely than members of non-Christian faiths to share their faith with others. Jehovah’s Witnesses are known for going door to door to discuss their religion, and 76% say they share their faith with nonbelievers or people from other religious backgrounds at least weekly. A plurality of members of the historically black Protestant tradition (44%) also say they share their faith with others at least once a week. Religiously unaffiliated respondents were asked how often they share their views on God and religion with religious people. Two-thirds of the unaffiliated (67%) say they seldom or never do this. As is the case with other forms of religious practice, blacks who are affiliated with a religion are more likely than affiliated Hispanics and whites to say they share their faith at least monthly, and affiliated adults without a college degree are more likely than college graduates to do this. But when it comes to differences by age among the religiously affiliated, this measure stands out: While older Americans display more religious engagement in several other ways, younger adults are slightly more likely than those ages 65 and older to share their faith. Speaking in tongues, a practice often associated with Pentecostal and charismatic churches, is not particularly common among Christians overall. Eight-in-ten U.S. Christians say they seldom or never speak or pray in tongues. Not surprisingly, speaking in tongues is more common within Pentecostal denominations in both the evangelical and historically black Protestant traditions, as well as nondenominational charismatic churches within the evangelical tradition. For example, 34% of nondenominational charismatic evangelicals report speaking in tongues at least weekly, as do 33% of members of Pentecostal churches in the historically black Protestant tradition. About half of Buddhists surveyed (48%) say they have a shrine or temple for prayer in their home. However, the 2014 Religious Landscape Study, which was conducted in English and Spanish but not in any Asian languages, may underestimate the share of Buddhists who maintain a shrine or temple in their home. Pew Research Center’s 2012 survey of Asian Americans, which was conducted in English and seven Asian languages, found that 57% of Asian-American Buddhists say they have a shrine or temple in their home. Certain religious groups, such as Hindus, Jews and Muslims, have traditional dietary restrictions. For example, many Hindus do not eat beef, while Islamic and Jewish laws forbid the eating of pork (among other things). Nine-in-ten U.S. Muslims say they never eat pork, and two-thirds of Hindus (67%) say they do not eat beef. By contrast, most U.S. Jews (57%) say they do eat pork. Most Americans (59%) say they experience a sense of spiritual peace and well-being at least once a week, up by 7 percentage points since 2007. And 46% of Americans report feeling a deep sense of wonder about the universe on a weekly basis, also up 7 points. 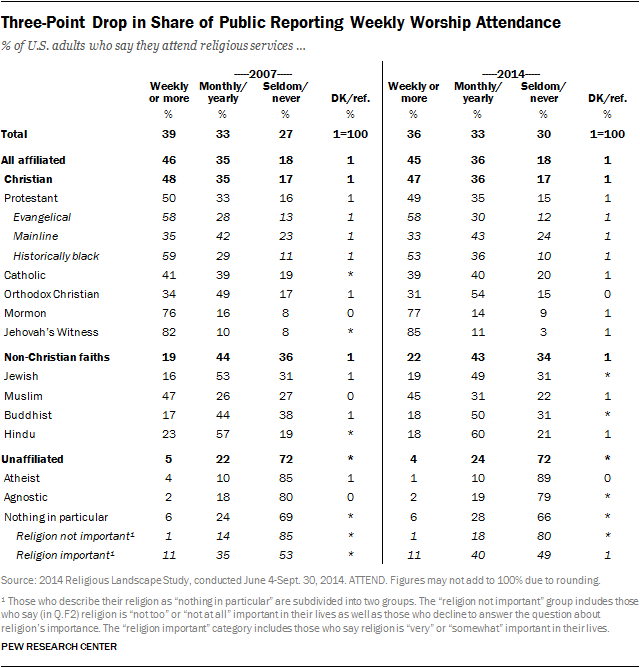 Groups that exhibit the highest levels of religious observance on traditional measures of religious practice (such as worship service attendance, prayer, etc.) also are most likely to say they regularly experience a sense of spiritual peace. Fully eight-in-ten Jehovah’s Witnesses (82%) and Mormons (81%), for instance, say they regularly feel a deep sense of spiritual peace, as do three-quarters of evangelical Protestants (75%) and members of the historically black Protestant tradition (73%). However, four-in-ten religiously unaffiliated adults also say they regularly feel a deep sense of spiritual peace and well-being. And the religiously unaffiliated are no less likely than those who identify with a religion to say they often experience a deep sense of wonder about the universe. In fact, self-described atheists and agnostics are somewhat more likely than members of most religious groups to say they often experience such a sense of wonder. More than three-quarters of Americans (78%) say they feel a strong sense of gratitude or thankfulness at least once a week. Fully 82% of Christians say they regularly feel a deep sense of gratitude, as do 73% of adherents of non-Christian faiths and two-thirds of the religiously unaffiliated (67%). A majority of U.S. adults (55%), including roughly six-in-ten Christians, think about the meaning and purpose of life at least once a week. Within Christianity, most members of historically black Protestant churches (72%) and Mormons (71%) often think about the meaning of life, as do majorities of evangelical Protestants (64%) and Orthodox Christians (63%). 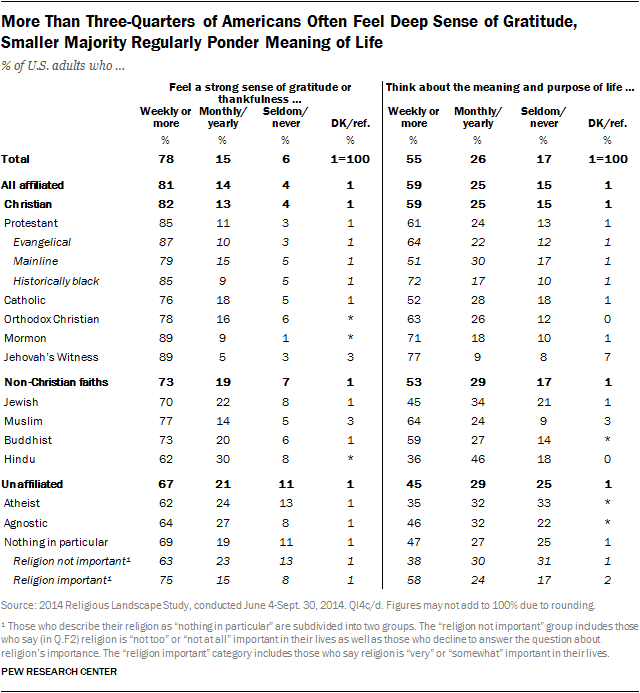 By comparison, 52% of Catholics and 51% of mainline Protestants say they regularly ponder the meaning of life. Among the religiously unaffiliated, 45% say they think about the meaning and purpose of life at least once a week.